Over the weekend, DIY crafting began promptly at 6:45 AM. 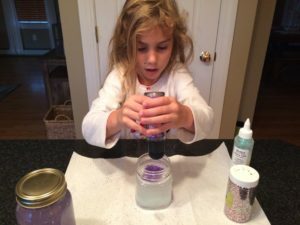 While it was probably way too early for glitter [there is NEVER a good time for glitter], it was a highly anticipated project — the roll out of bed, first question of the morning kind of project. 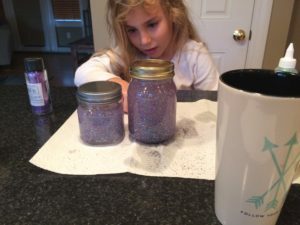 So, as I drank my morning coffee and was greeted with, “Can we make those jars now…?” – the glitter came out and the project began. With all of your Square World interest, I decided it would be best to put the simple steps together here. Now, let me preface the how to, with this – I did not come up with this concept, I borrowed it from a Mindfulness in the Classroom program I used to collaborate with. Trust me, I may be able to run and even write, but I am definitely not creative. mindfulness: the cultivation of stillness amongst the swirling chaos of life. Life, like glitter, swirls around. We wake up, and life starts. You pick up the jar and shake, and the glitter swirling ensues. The only way to get the glitter to stop is to sit and watch it settle. This is where the calm comes in. This is where stillness comes in. This is where we refocus the emotions and channel our expression effectively. As the glitter settles, we can approach rational again. We can put thoughts in order. We can make the next decision. Being still is harder than one would think. Find a safe glitter surface. Put down paper towel or paper bags for easier clean up. How is it that you always find glitter days later? On everything…? Heat water. The water does not have to be boiling, but it needs to be hot enough to melt the glue. Fill mason jar with hot water. Add glitter glue. You need a lot of glitter glue for this. Pending on the size of the jar, you may use half a bottle. Add and shake. 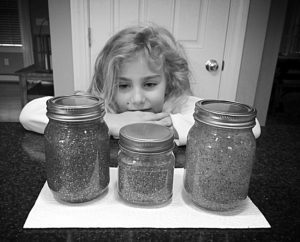 [If you are doing this project with little ones, you will want to shake the jar – it gets pretty hot to touch]. Add glitter. There is no set amount. Every jar is a little bit different. Add and shake. Add and shake. Once you have the desired amount of glitter, seal the top with glue. The mindfulness practice will not be very effective if it is found all over the floor. Clean the glitter for the next week. I hope you have some fun with this activity too! Share your pictures and glitter adventures. SWEAT. + CUT. SCOOP. EAT. We have made those before and they are fantastic!!! Happy Thanksgiving!